WASHINGTON, D.C. -- Young adults seem more hesitant to spend than did people of the same age group nine years ago. Among 18- to 29-year-olds, daily spending self-reports averaged $74 in 2016, down sharply from an average of $93 in 2008. Spending reports of other age groups were similar in 2008 and 2016. Figures represent the average of amounts that respondents reported when asked how much money they spent "yesterday"
The results are based on analysis of Gallup U.S. Daily tracking data. It compares 2008 to 2016 (rather than 2017 year-to-date) to ensure seasonal patterns in spending do not bias the estimates. 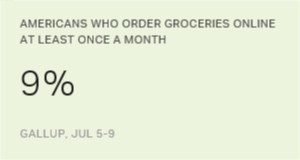 Since 2008, Gallup has asked U.S. adults to report how much they spent "yesterday." The measure, based on more than 175,000 interviews annually, gives an indication of discretionary spending. The full question wording is: "Next, we'd like you to think about your spending yesterday, not counting the purchase of a home, motor vehicle or your normal household bills. How much money did you spend or charge yesterday on all other types of purchases you may have made, such as at a store, restaurant, gas station, online or elsewhere?" Healthy consumer spending is key to sustaining the U.S. economy, and a slowdown among a key demographic group -- one often coveted by advertisers -- can hamper economic growth. U.S. adults' self-reports of spending were relatively high in 2008 before falling sharply in 2009 after the financial crisis and as unemployment rose. Americans' reported spending remained low until late 2012 and has gradually increased since then, to the point that the average recorded in 2016 ($92) nearly matched the average in 2008 ($96). So far in 2017, spending is on pace to match or exceed the 2008 average. But spending among young adults has not recovered as it has for other age groups. Young adults' spending is now similar to that of senior citizens, many of whom live on a fixed income. Spending usually is highest among middle-age groups, who tend to be in their peak earning years and may be spending more to support young children. Many young adults may not have found a job that pays well enough to support a higher level of spending. Indeed, an average of 2016 Gallup polls found 45% of 18- to 29-year-olds saying they were employed full time, compared with 48% in 2008. Young adults who attended college may be burdened with high student loan debt. Many young adults may have moved back in with family after college -- or never moved out -- decreasing their discretionary spending for certain services and product areas, such as household items. Fewer young adults in 2016 reported being married (18%) than did so in 2008 (27%). Married couples, often having two incomes, tend to spend more than unmarried people. Notably, however, both married and unmarried 18- to 29-year-olds in 2016 reported spending significantly less than the same subgroups did in 2008. Fewer young adults reported having children in 2016 (21%) than in 2008 (30%). Presence of children is a major predictor of spending. Because of changes in Gallup's survey, it is not possible to measure whether young adults with and without children spend less today than the comparable groups did in 2008. A 2016 Gallup report found higher percentages of millennials (those aged 19 to 34) saying they were spending more than in the past on things they need -- like healthcare, utilities and groceries -- than on discretionary items like dining out, leisure and travel. Thus, the money that young adults do have appears to be going to bills and nondiscretionary items, leaving less for discretionary spending. The 2016 report also found that millennials were more likely than older generations to engage in cost-saving measures like comparing prices online or buying used goods. Thus, even when millennials spend money, they may be spending less for the same goods than those in older generations are. It does not appear that young adults are any more likely than their older peers to value saving over spending. Gallup asks U.S. adults each April whether they, personally, enjoy spending or saving more. Since the recession, preferences have shifted decidedly toward saving. But young adults' expressed preferences on saving versus spending are no different from those of older adults. This suggests that younger adults' lower average reported spending appears to result more from their economic circumstances than from their attitudes about spending money. Consumer spending accounts for about two-thirds of the U.S. gross domestic product. GDP has grown consistently but sluggishly since the recession ended, and less-robust consumer spending is likely a factor in the weaker economic growth. Young adults appear to be more responsible than older adults are for the changes in spending. Sluggish growth may also be tied to a greater share of U.S. dollars being spent on healthcare, housing and education. Gallup estimates that the average amount of money left over after paying housing, healthcare and education is just 64 cents of every dollar. It is unclear the extent to which young adults' cost burdens in these areas are greater than, the same as or less than they are for older Americans. Many industries will need to re-evaluate the important young adult demographic to determine the best way to gain a larger piece of a shrinking pie. This may be especially true for retail if younger consumers continue to price shop, purchase goods online and spend less on discretionary items. Retail organizations should closely examine the spending patterns of their customers to better understand how current spending trends might be affecting their business and take appropriate steps to change their strategy, business model and offerings as consumers' spending habits change. One key question for the future is whether young adults will continue to be more frugal as they get older or if their spending habits will change as their life circumstances change. If younger adults get higher-paying jobs, have children, buy a home and reduce student debt loads, their spending is likely to increase. But if they are unable to find good-paying jobs and continue to be burdened by debt, they may have little left over to spend, which could make weak economic growth the norm in the future. 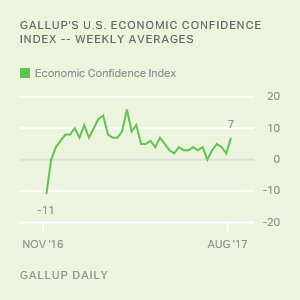 Results for this Gallup poll are based on telephone interviews conducted in 2016 on the Gallup U.S. Daily tracking survey, with a random sample of 177,788 adults, aged 18 and older, living in all 50 U.S. states and the District of Columbia. For results based on the total sample of national adults, the margin of sampling error on the spending mean is ±$1 at the 95% confidence level. For results based on the total sample of 23,493 18- to 29-year-olds, the margin of sampling error on the spending mean is ±$2 at the 95% confidence level. All reported margins of sampling error include computed design effects for weighting.